In November, 2015, former senator Michelle Bachman predicted that Jesus was coming soon because of unrest and violence in Israel. She had said earlier that President Obama’s foreign policy would quickly bring about the rapture. This view reflects a large number of evangelical thinking, sensing that the end is near and having a burden for the prophetic Word. Though having an understanding at variance with many, that concern has been contagious to thousands of Christians. Yet – He still hasn’t come. A great challenge facing all Christians is to segregate out subjective versus objective signs, that is, conviction based on opinion or tradition and simply events versus those based on events with timing frameworks. Let Us Reason e-magazine recently published an article suggesting that the concept of eschatology should even be totally dropped by Christians. What is really going on? Even the disciples thought that Christ would come in their day (I Peter 4:7). Is there such a thing as “present truth” within Biblical prophecy? Is the “Advent doctrine” of the Second Coming of Christ a nebulous concept? Is that belief, which Christians are told should “burn in our hearts” (Titus 2:13), wrong? Many hearing or reading this might be suddenly swept with a feeling that even questioning this as “uncertainty” is apostasy. But – there is something wrong! Reasons for the expected return of Christ have not changed in decades – maybe centuries. And – there are contemporary things occurring, fulfilling prophecy that are being ignored. Something is wrong! AND – that brings us to this study. Jesus rode toward Jerusalem, apparently coming down from the Mount of Olives, according to the Gospels. It was the occasion now called the “Triumphal Entry.” People put down their cloaks in front of Him with small branches of palm trees. The crowd added a further line, “Blessed is the King of Israel!” (John 12:13). Traditionally, entering the city on a donkey symbolized the arrival of a king of peace, here identified by the Jewish people as the “King of Israel.” It was their Messianic Confession. Approaching Jerusalem via the Mount of Olives was also significant. Zechariah 9:9 and Zechariah 14:1-5 state that the Messiah would come to that city from that Mount! “He saw the city and wept over it, saying, ‘If you had known, even you, especially in this your day, the things that make for your peace! But now they are hidden from your eyes’” (Luke 19:42 – NKJ). As Jesus had done before, the city is personified. If they had known prophecy, they would have experienced this as a gesture of peace. This “peace” was not with the Romans who had the Jews under subjugation nor that of the suppressive Jewish rulers of the Temple, but all that embraces salvation! Instead of redemption, they would now experience judgment. Had they known prophecy, they would have known this was the time for the Messianic advent. Prophecy of the advent of Israel’s Messiah would be forever hidden from the Jewish people. Even today they still expect the Messiah/Savior to arrive on this earth, fulfilling Christ’s prediction. Then He notes that the city, the nation, would be destroyed. It will become desolate. Interestingly, at the end of time there will be a desolation coming to the whole world, which will be final (Daniel 12:11), fulfilling the second meaning of this text. Christians often succumb to the temptation of compartmentalizing time when analyzing Scripture. However, many stories of the past are metaphors for the future. Repeatedly, there are dual meanings to much of the Old Testament’s drama and predictions. Jesus had also recently said: “And now I have told you before it come to pass, that, when it is come to pass, ye might believe” (John 14:29 – KJV). A knowledge base is imperative. As prophetic fulfillment reaches its “purpose” – it was divinely designed to be recognized. That is one of heaven’s “tools” to strengthen faith. God supplies amazing details of how it will be fulfilled. There is a time when prophecy is to be implemented or accomplished. As prophecy unfolds, it is to be a faith-strengthening experience. If it is not studied by an individual or a group, there is a risk, a danger, that God will not permit it to ever be understood. The cost of not knowing and not being ready is heavy. A Divine indictment occurs. A verdict is rendered leading to eternal loss. Confrontation between the Jewish leaders and Christ was not uncommon. On one particular occasion the Pharisees and Sadducees banded together to initiate a trap. “by asking him to show them a sign from heaven” (Matthew 16:1 – NIV). This was entered by no desire to see a supernatural act. It was designed to hurt Jesus when under pressure. Jesus had just fed perhaps 10,000 people with seven loaves and a few fishes. They did not accept that as a stunning “sign.” It was a display of His divine power. Blinded, they tried to create a situation that would destroy faith among His followers (blind His followers). Note: They added the phrase “from heaven” to this request. They wanted to be sure it came from God! “He said, ‘When evening comes you say, “It will be fair weather, because the sky is red,” and in the morning, “It will be stormy today, because the sky is red and darkening.” You know how to judge correctly the appearance of the sky, but you cannot evaluate the signs of the times’” (Matthew 16:2-3 – NET). Just before Jesus actually walks away, He says: “A wicked and adulterous generation asks for a sign, but no sign will be given to it except the sign of Jonah.” Then he left them and went away” (Matthew 16:4 – NET). His resurrection would be the sign – no other event would so completely seal the divine nature and mission of this Man they are trying to demean! Wanting and/or waiting for a specific sign to “convince” a doubting mind may create blinders to things that are already occurring. Incomplete understanding, because of a lack of knowledge (which is inexcusable), can lead to Jesus walking away from us. Testing God is extremely serious. Peter called this type of situation “willing ignorance” (II Peter 3:5) and noted “fire” would be heaven’s judicial response. Another profound maxim came during that kingly ride toward Jerusalem. He had just predicted the total destruction of that “city” – really a metaphor for a people previously God’s chosen. “They [the Roman enemies] will demolish you – you and your children within your walls – and they will not leave within you one stone on top of another, because [here it is] you did not recognize the time of your visitation from God” (Luke 19:44 – NET). The Greek word for “time” here is kairos. It refers to an “appointed time” that had been set aside. It is a “decisive divinely ordained point” in time. It is when prophecy is fulfilled. It symbolizes here an intensely serious climax to something that could have been known. Jesus is giving a reason these people won’t be saved. They didn’t recognize the soteriological completion of this prophetic moment. Time is an embedded issue in prophecy. It is designed to announce “when” an “end” approaches, “when” the last opportunity comes or “when” it is over. The word for “visitation” in the Greek is episcopes. It contextually refers to the gracious presence of divine power when salvation still lingers. Eternal punishment will come to those who ignore contemporary prophecy. Identifying that “time” within prophecy could be a salvation issue – contrary to the opinions of many expositors. There is a point in time when there is no further chance to be saved – redemptive probation will close. Not all of the principles of Biblical interpretation apply to each prophecy. But, discerning the meaning of a prophecy requires many of these principles Jesus gave. 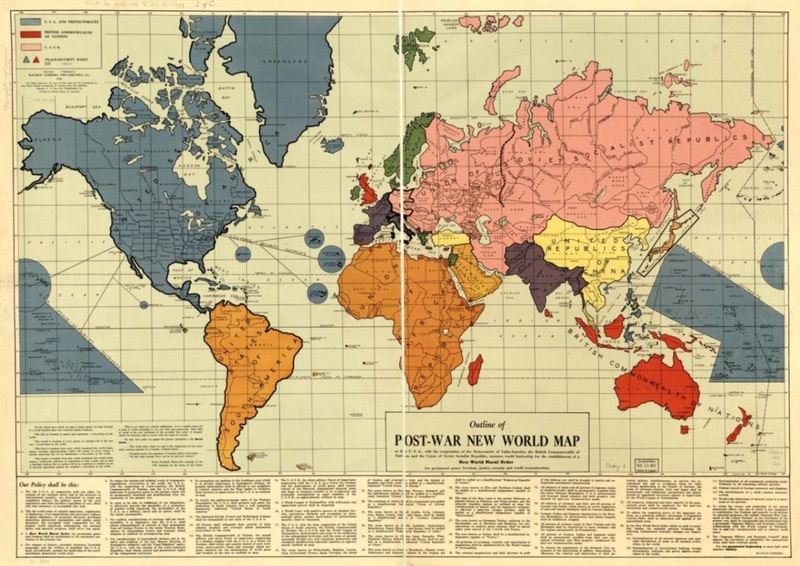 There is a time when prophecy is to be implemented or accomplished within its narrative. The cost of not knowing and not being ready is heavy. A Divine indictment occurs, a verdict is rendered and an eternal loss. Wanting and/or waiting for a specific sign to “convince” a doubting mind may put blinders to things that are already occurring. Incomplete understanding because of a lack of knowledge (which is inexcusable) can lead to Jesus walking away from us. Let’s apply these to a contemporary issue that is evolving! “‘Come, I will show you the judgment of the great harlot who sits on many waters, with whom the kings of the earth committed fornication, and the inhabitants of the earth were made drunk with the wine of her fornication’” (Revelation 17:2-3 – NKJV). “The ten horns that you saw [on a beast – vs 3] are ten kings who have not yet received a kingdom, but will receive ruling authority [contextually, over the world] as kings with the beast for one hour” (Revelation 17:12 – NIV). “… all the world wondered after the beast [that ten-horned beast]” (Revelation 13:3 – KJV). Then the record says, These kings have a single intent – and – they will give their power and authority to the beast. (Revelation 17:12-13 – NET). This is amazing. This beast not only has a coregency with these ten key world leaders right at the end – but the intent of these rulers will be to give their power to this beast! This is a prophecy of a world order with a Roman head as never before seen! In Revelation 13:2 the beast that emerges from the sea now has a crown on each of its horns! Somewhere between Revelation 17 (an interlude) and Revelation 13 (the prophecy corpus) those kingdoms form. This relates to the very end of time because it is the story of how the harlot and the beast, who is carrying her, come to an end during the seventh vial plague (Revelation 16:19, 17:1)! One of the harlot’s names is “Babylon” (Revelation 17:5). As a prophetic symbol, she represents an apostate church and a false trinity. Since she is sitting on “many waters” (vs 1), representing the people and nations of the world (vs 15), she does receive authority over all planet earth. Since she will sit on the beast, whose seven heads represent the seven hills of Rome (vs 9), we know this church is in that city. Since she is sitting on a beast, she rules a nation or kingdom. This reveals a church that governs a state. The Roman Catholic Church is identified with its Vatican City State. The angel gave more details: “These kings have a single intent, and they will give their power and authority to the beast” (Revelation 17:13 – NET). Is there a maturing relationship between world leaders and the Vatican? If that development can be shown, it will be one of the additional objective signs that the end of time is approaching. 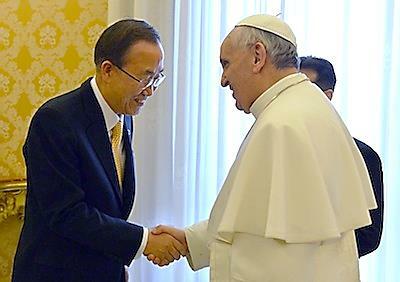 On May 9, 2014, Ban flew all of the chief executives of the Board for Coordination (the top leaders) of the United Nations (U.N.) to meet with Pope Francis. The U.N. Secretary said that he counted on the Catholic Church to continue working closely with the United Nations to promote a life of dignity for all on earth. “Inequality is growing. Injustice is prevalent. There is too much intolerance among peoples and faiths. All of these aggravate insecurity. 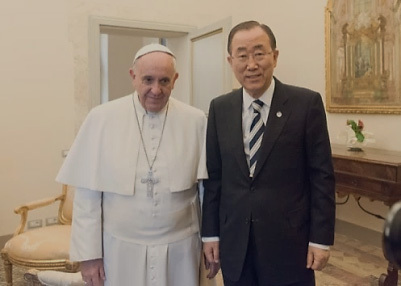 On April 28, 2015, the Secretary General flew again to Rome for a historic meeting sponsored by the Pontifical Academy of Sciences on Climate Change. Cardinal Peter Turkson, President of the Pontifical Council for Justice and Peace, told the gathering that from a faith perspective, there is an “all-embracing moral imperative: to protect and care for both creation, our garden home, and the human person who dwells herein – and to take action to achieve this.” This was all a prelude to the release of the Pope’s climate encyclical in May – Laudato Si. Ban Ki-moon noted that though the United Nations had no religion, the goals and efforts of the Roman Catholic Church paralleled theirs! Interesting! Later, September 25, 2015, Pope Francis addressed 150 world leaders at the United Nations, appealing to the citizens of the world to act for the “common good” of all. 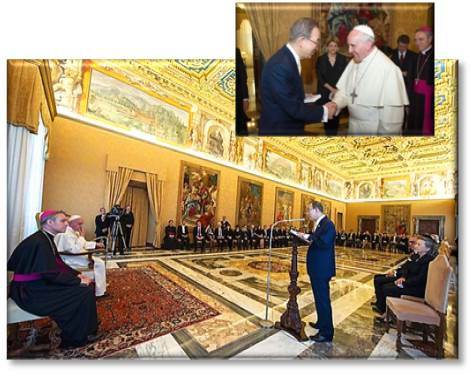 In January, 2016, the Global Foundation, an international non-profit organization, called for a meeting at the Vatican to address how the business communities of the world can work with the papacy. There had been tension, even within the Holy See, over capitalism, which Pope Francis derides, and a free market economy, which many cardinals support. Catholic leaders attending included, as examples, Christine Lagarde, managing director of the International Monetary Fund, and Robert Thomson, CEO of News Corp, which owns The Wall Street Journal. 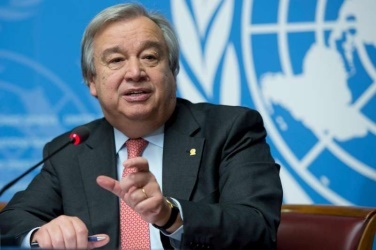 October 13, 2016, the General Assembly appointed the former Prime Minister of Portugal, António Guterres, as the next United Nations Secretary General. He is a devout Roman Catholic. He assumed office January 1, 2017. Global Forum is an internationally recognized think-tank with research and development experts for exchange and networking among governments and private and public organizations. 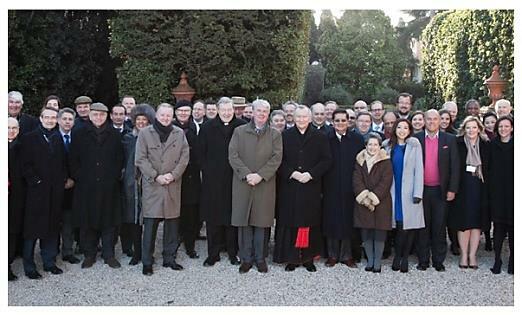 On December 2-3, 2016, this agency, with Fortune 500 and Time Inc. sponsorship, gathered business leaders from the world’s largest companies, members of the Time 100 list of the world’s most influential people and a cross section of leaders from NGOs, non-profits, organized labor and religion to meet with Pope Francis and Vatican Officials. Inspired by the Pope’s pleas for more and better jobs, broader prosperity, and lasting ways to lift the poor, the Forum was a solutions-based “conversation.” Forum attendees engaged in dialogue on many international subjects, including technology and jobs, global health, food and water, commitment to communities, energy and the environment and financial inclusion – each representing critical elements to the alleviation of poverty that need urgent attention. 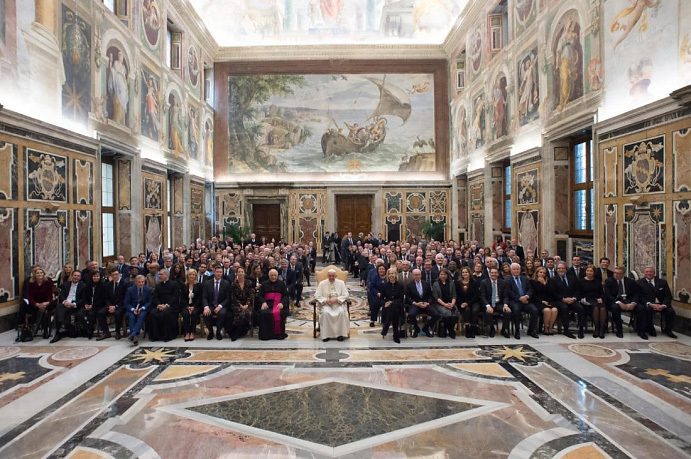 Out of this came more than 100 corporate chieftains, thought leaders, scholars and experts in labor, health, education, economics and the environment, along with Pope Francis, forging a new “social compact” between big business and the global community. This is all a compelling prophetic series of events! The papacy had been “perfecting” a social agenda for over a century. Now its “dogma” is captivating the world. In 1891 Pope Leo XIII published an encyclical called Rerum Novarum. It was the Roman Catholics’ first formal directive regarding globalism. It was based on Marxist principles. Many popes since have made addendums to this document. The most coercive was by Pope Paul VI, Populorum Progressio in 1967. It was dubbed Marxism by even the Wall Street Journal. In 2014 the papacy embraced Liberation Theology and even brought its aging founder, Gustavo Gutiérrez, to the Vatican for a visit. This ideology embodies the means for globalism, much like the discussions of the Global Forum in December. Mid-January, 2017, the pope publically defended this socialistic marriage between Marxism and Christianity. Now with the pope’s help, the U.N. hopes to bypass the U.S. Congress on global socialism – a form of Marxism. Will President Trump facilitate this? Why has the world gyrated so much toward the Vatican and the papacy? The U.N. is enamored with the power and image of this agency that has its fingers in the lives of over 1.2 billion followers in 180+ counties. No single organization matches such dynamic influence! It operates as a geopolitical organization. Bible prophecy predicted this would occur. The time has arrived to objectively say: An end-time sign has emerged. Incidentally, the Club of Rome, the World Trade Center and the United Nations have also divided the world into ten regions! This echoes the ten horns that purposed to give power and authority to the beast – something to think about. What principles regarding known prophecy have been used in this analysis (from summary, page 7)? Principles 1 through 3 and 10 – and, hopefully, 11 and 12. Hopefully, never 4 through 9 and 13. Should there be a wide-spread Christian response as is crescendoing in the evangelical world? White, Ellen G.; Testimonies, vol. 5, Sept 25, 1881 (emphasis added). White, Ellen G.; Maranatha, p. 106, 1903 (emphasis added). White, Ellen G.; Australian Union Conference Record, January 15, 1904 (emphasis added). White, Ellen G.; Counsels to the Church, p. 37, ~1909 (emphasis added). Green, Joel B.; The Gospel of Luke (William B. Eerdmans Publishing Co.; Grand Rapids, MI), p. 690. Green, op. cit., p. 689. Nolland, John; The New International Greek Testament Commentary (William B. Eerdmans Publishing Company; Grand Rapids, MI), p. 647. Keener, Craig S.; A Commentary on the Gospel of Matthew (William B. Eerdmans Publishing Company; Grand Rapids, MI), p. 420. Hagner, Donald A.; Word Biblical Commentary (Nelson Reference & Electronic, Division of Thomas Nelson Publishers), vol. 33B, p. 680. Barclay Newman Greek-English Dictionary, Bible Works 9. Thayer, Greek-English Lexicon of the NT, Freiberg, Analytical Greek Lexicon, Bible Works 9.